The Haunn Group’s philosophy starts and finishes at a different place – above the horizon. We focus on what a client values before focusing on the value of what they own. The primary objective is to help clients make wise decisions surrounding their wealth. Most High Net Worth individuals and families have engaged in some form of planning with various professional advisors. For the most part, these relations tend to work as silos, but we encourage all advisors to work together on strategies, tactics and tools on behalf of the client. Families want to grow and protect their assets in order to transition what they want to the next generation. We create a plan that carries your wealth to future generations. Most of our clients are concerned about the return of their money, not the return on their money. We assist our clients to preserve & protect their assets by paying less fees and less taxes. At the Haunn Group we focus on what a client values before focusing on the value of what they own. This approach ensures all financial decisions are based on a client’s personal values, helping us design an integrated wealth plan to eliminate risks and capture potential opportunities. The Haunn Group is not limited to comprehensive planning solutions. Some clients are more interested in Single Purpose Planning – where they have an immediate issue that needs to be addressed. We review and then provide a second opinion on their current strategies, tactics and/or tools. 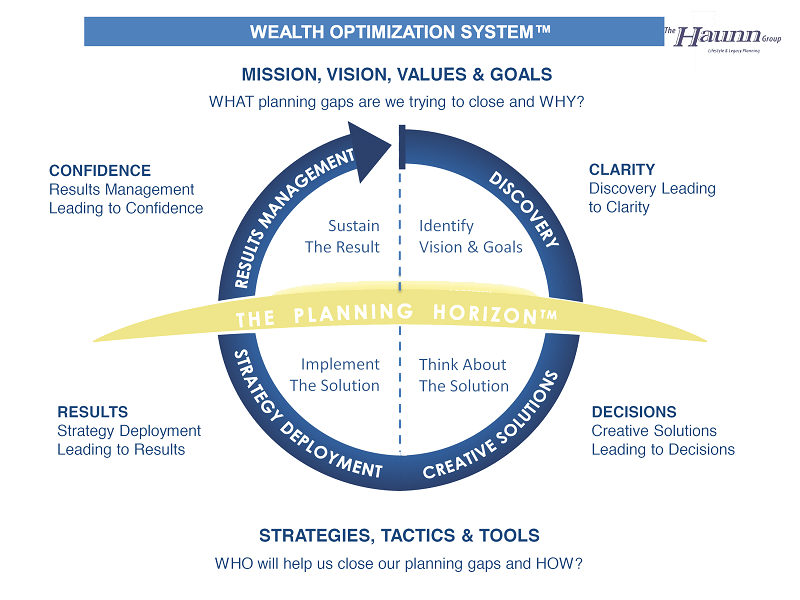 Our integrated wealth plans help eliminate risks and capture potential opportunities through various planning methods. Plans have a focus on accumulation of wealth as you strive to become financially independent. You work for Money. Plans are focused on protecting your resources as wealth begins to work for you. Money works for you and starts to build excess. At this stage, the Plan shifts from protection and accumulation of wealth to the transfer of resources and excess. The Haunn Group uses a framework for making planning decisions to reduce dangers associated with financial transcendence, while capturing all of its’ possibilities. The concept of leaving your kids or grandkids some money. We guarantee that they way they would spend the money would be different from the way we would spend it. We find a lot of our clients are concerned about the negative impact that wealth may have. The concept of social capital is the amount of money you earn, but cannot keep which can then be distributed between charitable gifts and taxes.